Ten years ago I wrote my first climate article at The Register. 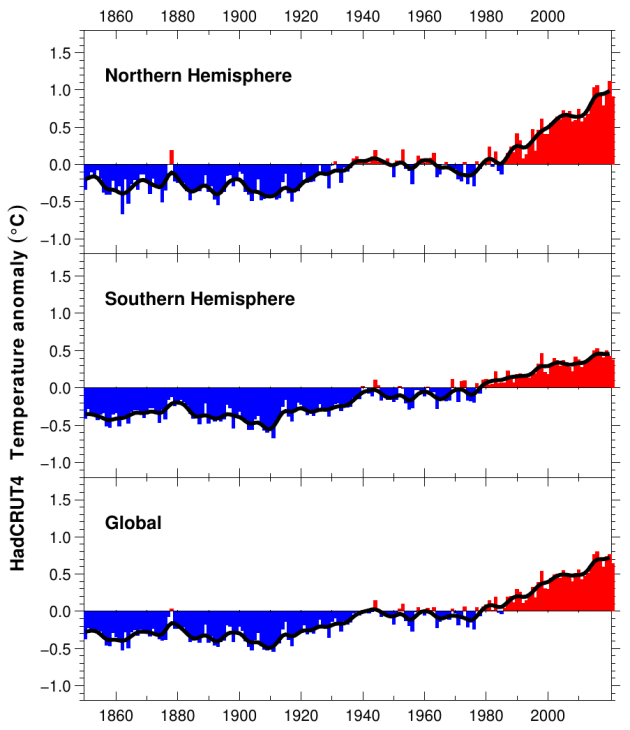 Two authorities provide us with analysis of long-term surface temperature trends. 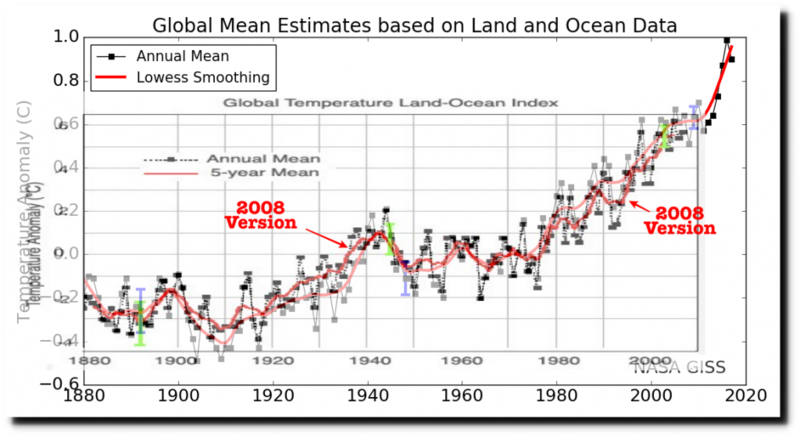 Both agree on the global temperature trend until 1998, at which time a sharp divergence occurred. The UK Meteorological Office’s Hadley Center for Climate Studies Had-Crut data shows worldwide temperatures declining since 1998. 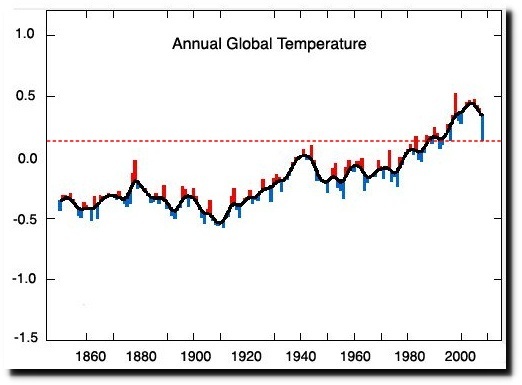 According to Hadley’s data, the earth is not much warmer now than it was than it was in 1878 or 1941. This was the Had-Crut graph in the article. This is the current Had-Crut graph. Note that the post-1998 cooling has since disappeared. 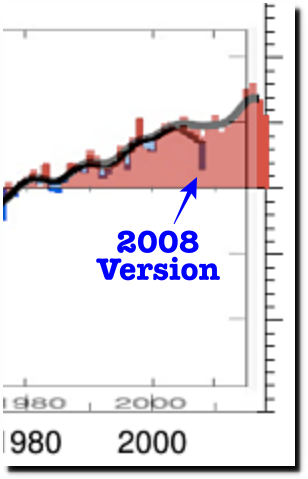 Since my 2008 article, NASA has also cooled the past and warmed the present. The year after I wrote that article, the Climategate E-Mails were released. 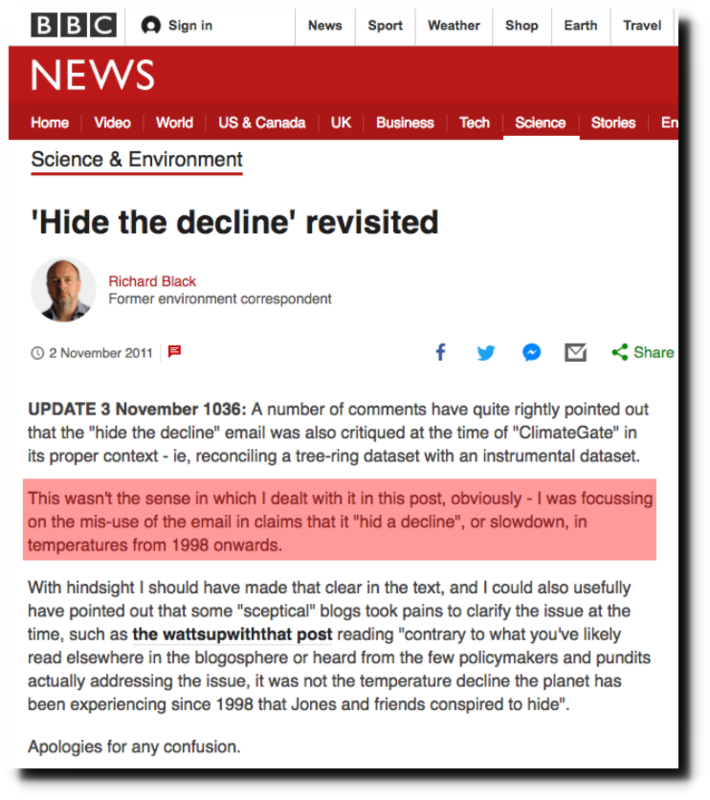 The original context of “Hiding The Decline” was not hiding the post-1998 decline in temperatures, as this 2011 BBC article pointed out. Richard Black at the BBC angrily announced that CRU was not hiding the post-1998 decline, before he realized that isn’t what people were complaining about. The original “hide the decline” claim is one of the most easily de-bunked in the entire pantheon of easily-debunkable “sceptic” claims. 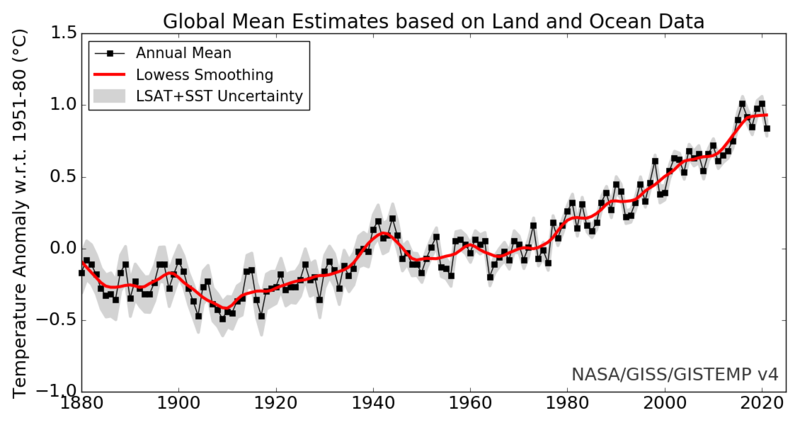 Phil Jones wrote the email in 1999, immediately following what still ranks as one of the hottest years on record, and well before the idea of a “slowdown” or “hiatus” or even “decline” in warming gained currency. So it can’t have had anything to do with hiding a global temperature decline. But now, CRU is hiding the post-1998 decline. 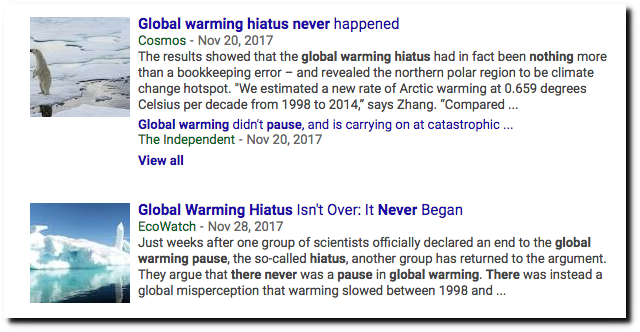 And the hiatus which the BBC wrote about in 2011 has since been officially disappeared by the climate mafia. Deceitful manipulation of data, concealment or straightforward destruction of inconvenient evidence, vindictive conspiracies to silence critics, are par for the course in all scientific debate. But in displaying all these characteristics, the CRU e-mails graphically undermine the claim of the Warmers that they command the moral as well as scientific high ground. Great article from 2009 has proven clearly true today, yet the left acts like they’re vindicated. They never quit, they just morph, like a virus. People should focus on tying the cause to the effect. CO2 is claimed to cause the temperature increase. If that is the case, experiments should be run to isolate the impact of CO2 on temperature. While that is difficult for a climate system, generalities can be made. Here is an example of how to isolate the impact of CO2 on temperature using a scientific approach, not a computer model. Thanks for the link Bruce…great article. “Hide the decline” wasn’t connected with instrumental temperature measurements, but with the decline in proxy temperatures.